Last update noted that we had an apparent impulsive decline in SPX -- and that told us that the odds favored lower prices were coming, which then happened almost immediately after Monday's open. Monday turned into a nice downtrend for bears. Interestingly, once SPX broke the noted black trend line, it traveled almost straight down to the next trend line on the chart below (in red). There, it initially bounced, but then broke briefly below it and has been whipsawing around that line ever since, going back to mid-Monday. 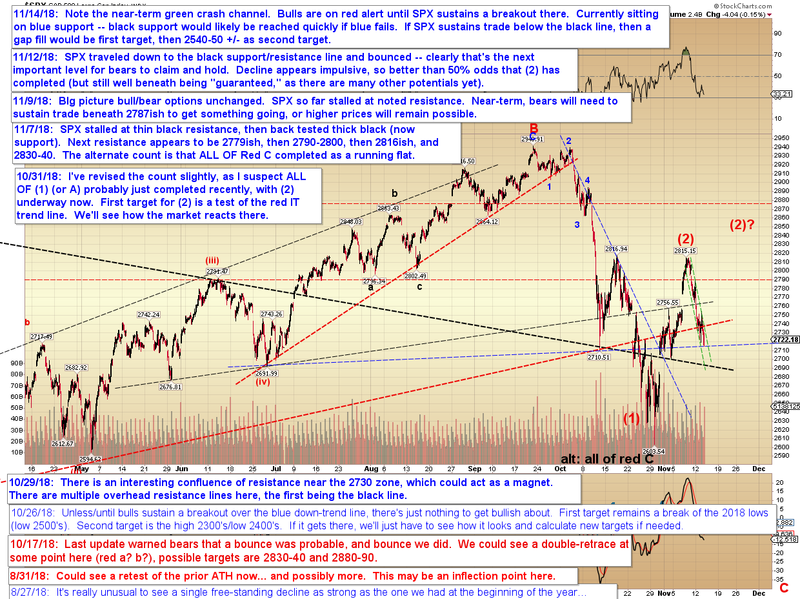 Next is an edumacashunal chart, because we just witnessed one of the most complex corrections you'll ever see -- so this may be helpful to those attempting to master Elliott Wave. What we saw was what's termed a "double three," however it was an exceptionally complex example, because there were double threes within the double three, as well as expanded flats. Starting at Monday's first low, we had red ABC to blue W, then another red ABC to blue X, then another red ABC, this time as an expanded flat, to blue Y, which completed the larger green W.
From green W, we had red ABC to blue W, then another ABC (not labeled) to blue X, then another ABC to complete another blue WXY, and thus complete green X. Then we had a simple expanded flat red ABC to complete green Y. These types of patterns are borderline impossible to predict, outside of the very short term (for example, on our private forum, I called the first top at 2748 in real time to the point -- but there was no way for me to know at the time that was only the first of SEVEN total ABCs!). In these events, nimble traders who take at least partial profits on the new low win, while less nimble traders may end up getting whipsawed. Corrective waves are inherently unpredictable, and they offer the greatest opportunity for traders to lose money if they're not careful. Most of our money is made during impulse waves, either up or down. Sometimes it's good to take a break when one is expecting a fourth wave (which is what I suspect the above pattern is), because they are known for their complexity, and can be all-but-impossible, or even literally impossible, to predict. Now, the tricky part is: While the above pattern does represent a complete fractal at one degree (meaning the market can trend again if it wants to), we can't confirm yet that this correction is actually over! Because, just as we see the fractals within fractals on the above chart (WXYs that complete only to form even LARGER WXYs), it's not outside the realm of possibility for the large green WXY to mark only wave W of an even larger WXY, with X unfolding into yesterday's close and Y-up still to come! I'm not predicting that as the outcome because, well, NOBODY can predict that as the outcome at this stage. It either happens or it doesn't. However, at least we're alert to it -- and we can state with some certainty that it's quite unlikely the decline is complete OVERALL. In other words, if we do get a larger Y-up rally, we would know from the pattern so far that it's likely a solid short op. 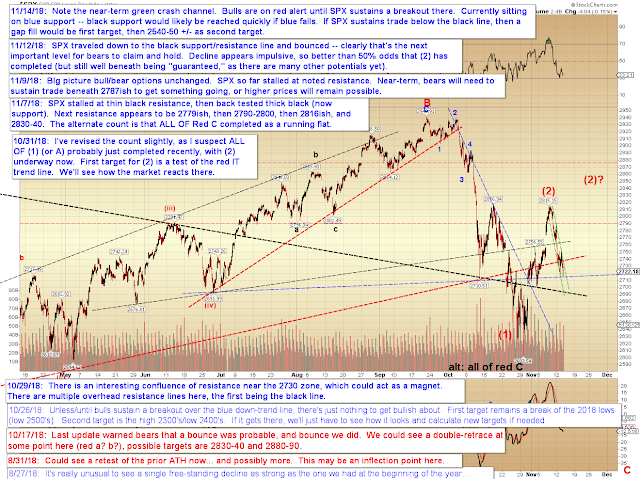 For now, we'll presume the WXY marks a completed fourth wave, with a fifth wave down to come in the next session or two, but if SPX cannot sustain a breakdown of the most recent lows, stay alert to the more complex pattern showing up, perhaps unfolding as a trip toward 2759ish before the next wave down begins. Trade safe.